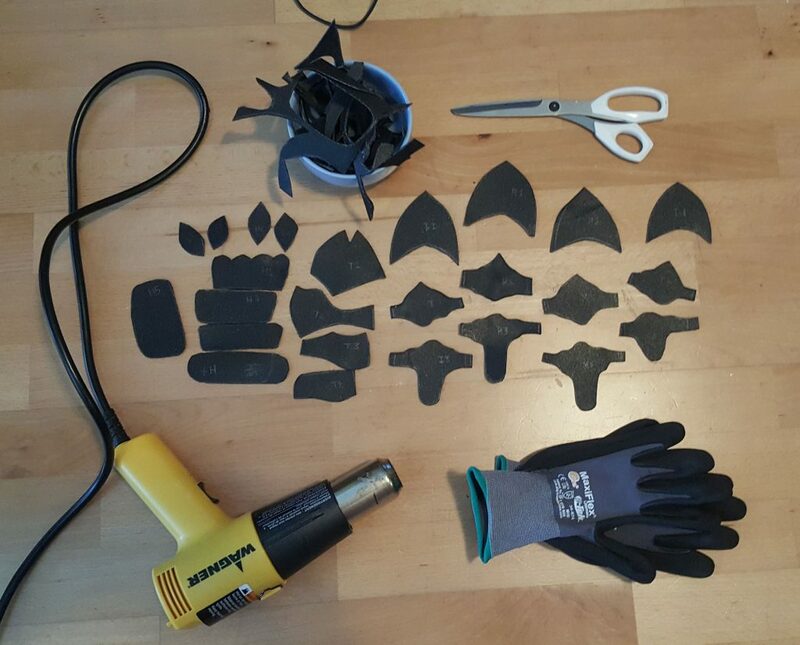 Gauntlet Tutorial from Patterning to Assembly! 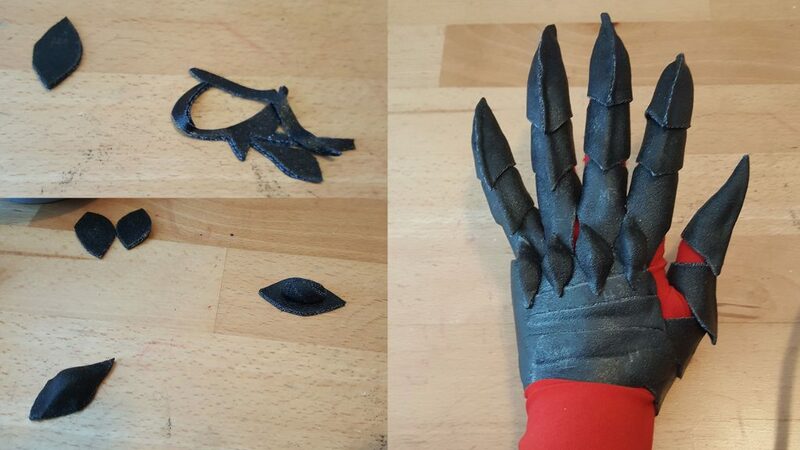 We asked Piratica (Captain Pira on Instagram) to create a tutorial for us using Black Worbla and she shared this great writeup on making a gauntlet, using Flemmeth from Dragon Age as an example! 1. Gather your references. 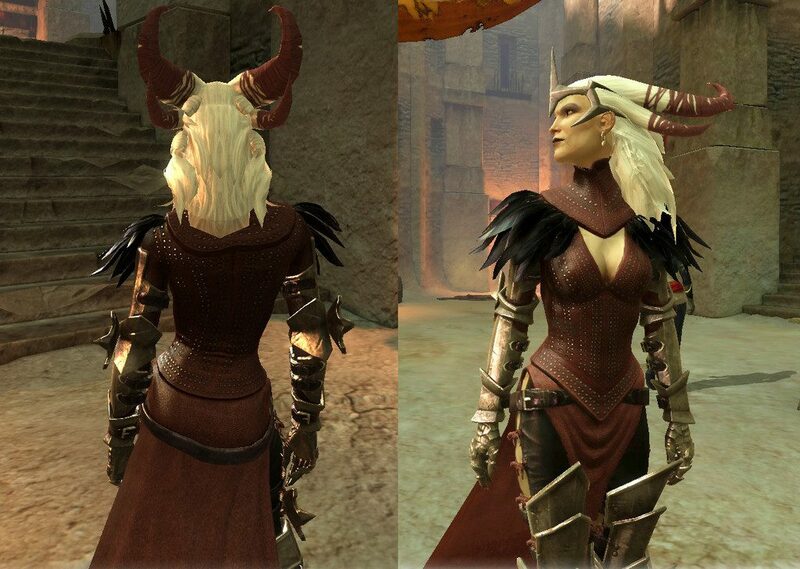 Front, back, sides. Trying to understand how it works before you start always makes things go smoother. 2. Put on your glove. If you’re only making one (like McCree or Asami’s glove) put on the wrong glove inside out. You’ll be ruining this glove so don’t use the one you’ll want in your finished piece. 3. Using your marker, draw circles around your knuckles and lines where your fingers bend onto your glove. Whatever design you’re making, you’ll want to be able to bend your fingers. Remember your thumbs. 4. Start to draw your design. This glove has pointed fingers and knuckles, so I continued segments into points over the knuckles. Also draw on any panels for the back of your hand, or indications where rivets or crests might go. 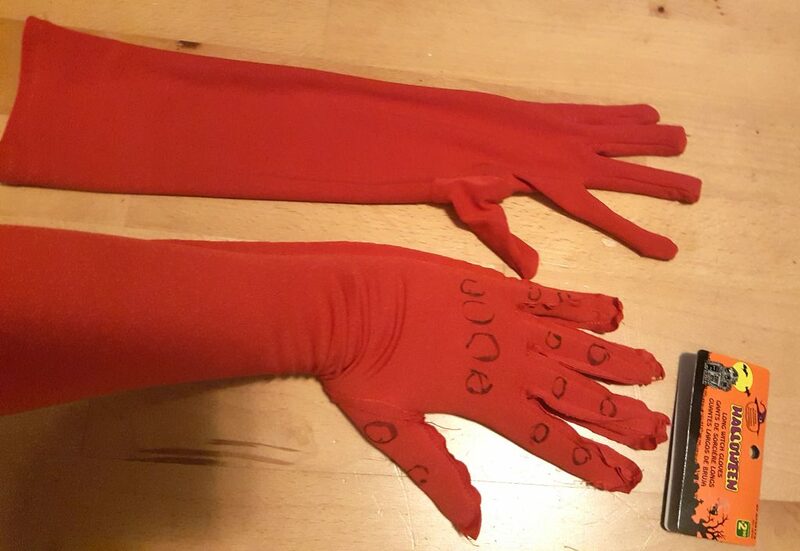 Drawing a line around where your wrist bends can also help you build a more wearable glove. 5. 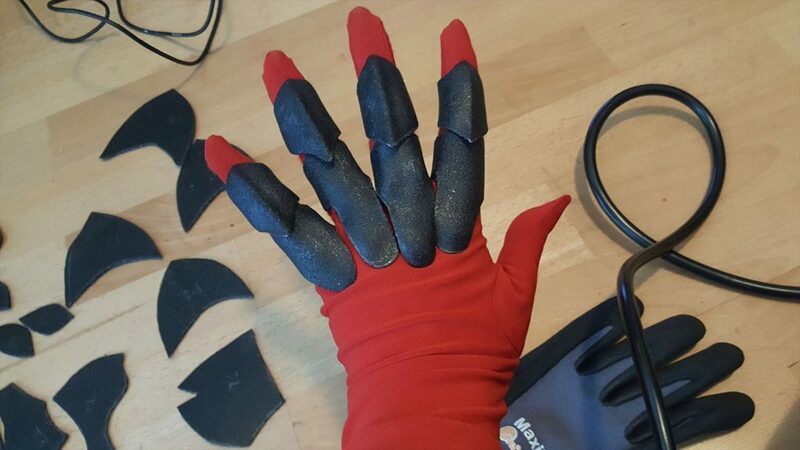 When your glove has all the details you want in your gauntlet, take it off and cut out your finger segments. I recommend cutting across around the knuckles, and then snipping them open on the palm-side to create a flat piece. Trace this piece out onto paper. If your design has overlap, like the knuckle spikes here, it’s usually easiest to cut it at the knuckle, then when you draw your piece on paper, to continue the circle you marked your knuckles with. This allows me to make sure the knuckle is covered at the hidden end, and shows me how big to draw my spikes on the pointed end. 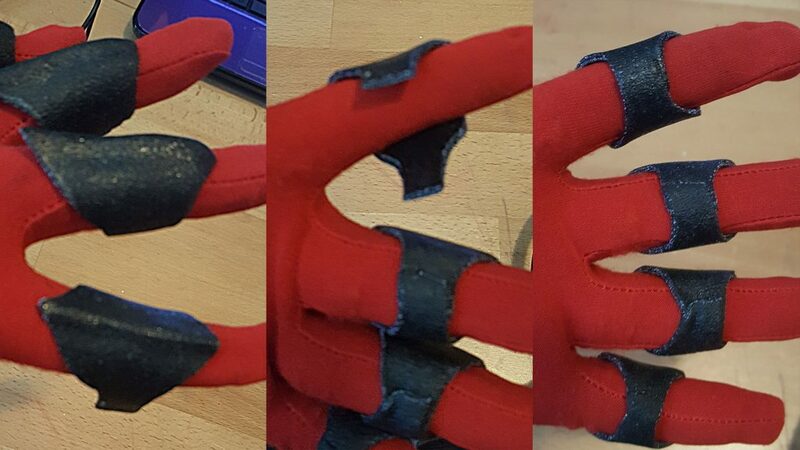 For finger tips, if you want finger shaped ones (like Iron Man) use the glove tips, but cut more darts to get your flat pattern. Spiky fingers are done by adding to the flattened design. I added an extra cm at the tip, and tapered to it. If you want your fingertips to curve in like claws, you’ll want a Star Trek logo shape (as I switched to after this step), but if you want them to curve straight on the top, you’ll want to make a shield shape (as above). 6. 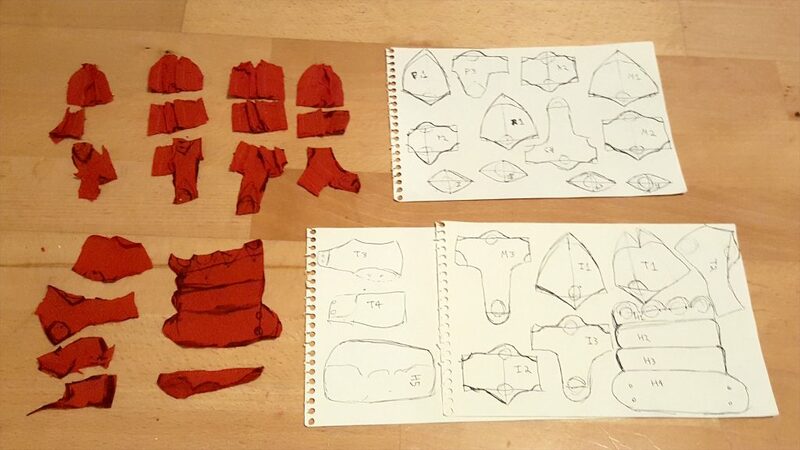 Continue to cut pieces out from your glove and trace them onto paper until you have all your pieces. Label as you go! Finger pieces tend to look similar but fit very differently. A naming system like Pinky 1, Pinky 2, Pinky 3, Ring 1, etc can save you a lot of headache later. 7. TEST YOUR PATTERN. 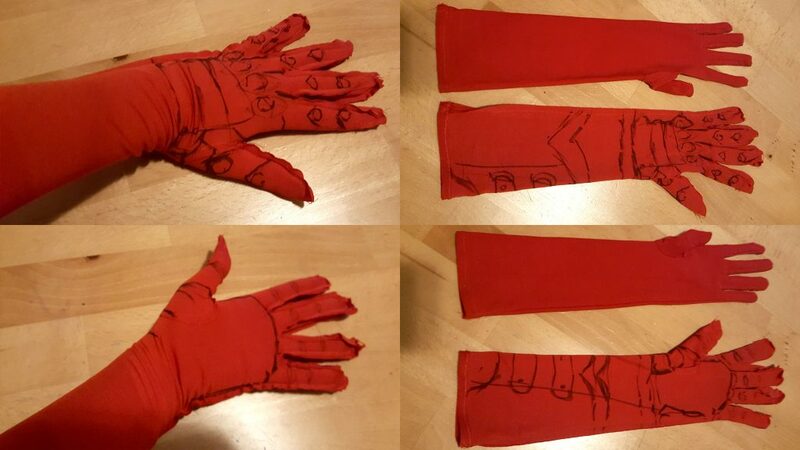 Cut out all your paper finger joints and try them on, over a new, whole glove. 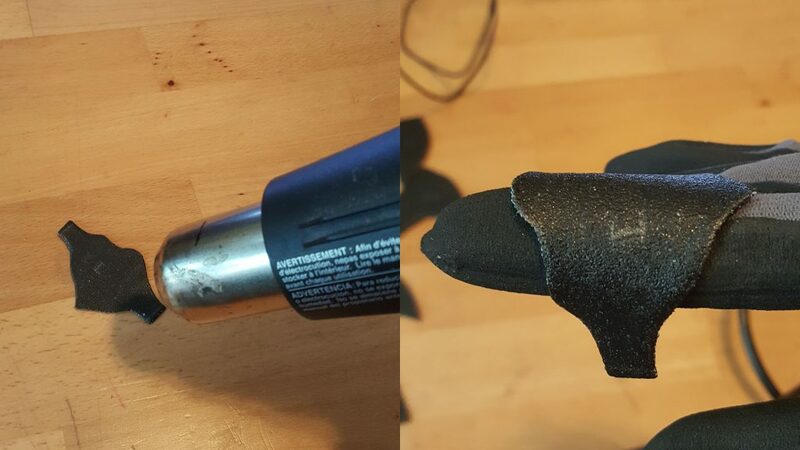 If your original glove stretched to fit your hand, you’ll probably need a few extra mm at each end to compensate, plus the added bulk of the glove itself. The easiest way to test and expand a pattern is to put masking tape on one end, put the piece in place on your gloved hand, then connect the other end with the tape, where it closes comfortably. Then slide the segment off your finger, and snip apart the masking tape to have your new fitted size. 8. 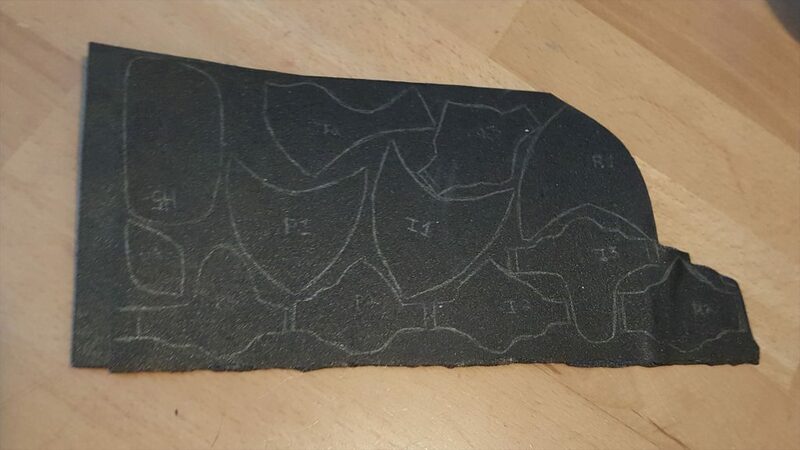 When you’re happy with the fit of your pattern, trace your paper pattern onto the matte side of your Worbla with pencil. Label these too! 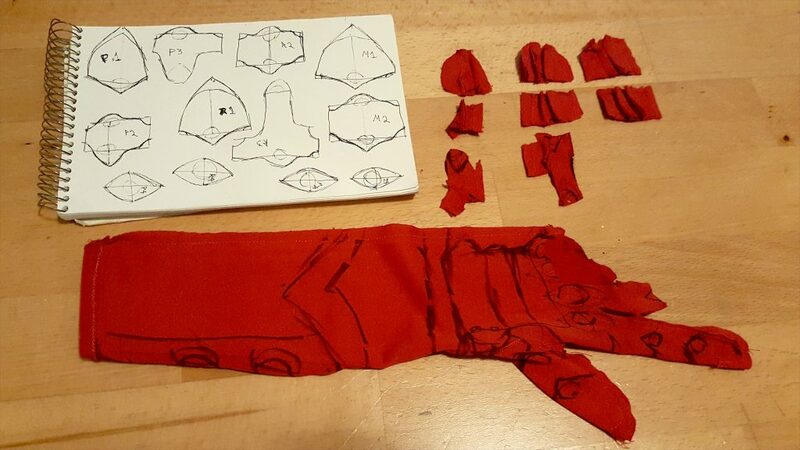 Finger joints are small, so instead of covering a layer of foam, use two layers of Worbla. 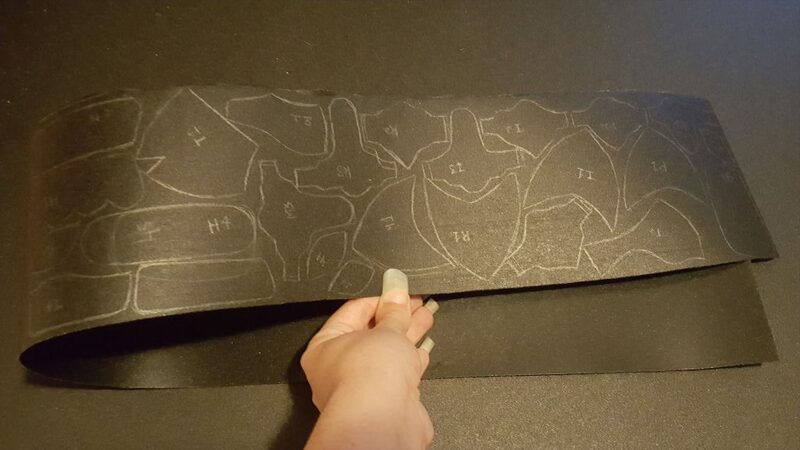 Try to Tetris your pieces to save material, and have enough space to either fold your Worbla over or cut out another piece the same size. 9. Heat your sheet! 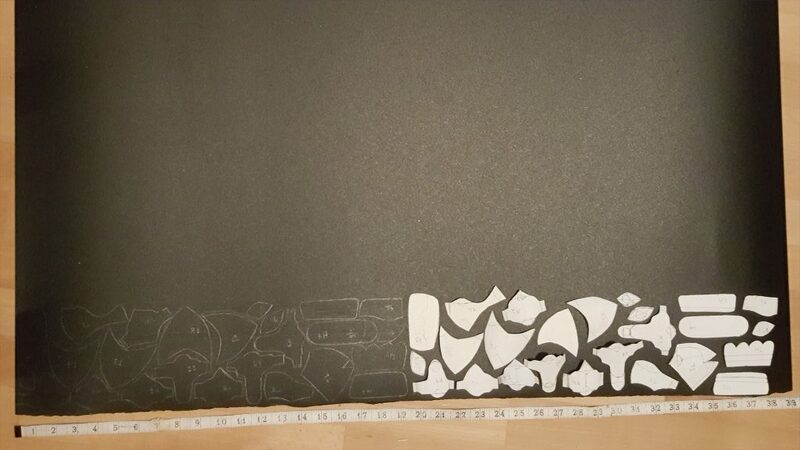 Before cutting out every piece, cut out the whole area you’ve drawn pieces on, and a second piece the same size (if your shape isn’t a rectangle, make sure to cut the 2nd shape mirrored). Put on you heat gloves and use your heat gun to warm both pieces until they are approaching the activation temperature. Press them together with the shiny sides in. Place this on a flat surface and continue to heat it until it reaches the activation point. Press gently and make sure your pieces are joined evenly. 10. Allow to cool enough your pieces won’t warp, then cut out all your pattern pieces. Keep your scraps for making rivets, details or other projects. 11. Now the fun part. Grab a finger joint and heat it up. Wrap it around a heat glove covered finger until it is cool enough to touch. Then put on your costume glove, and wrap the piece around the appropriate joint, connecting the sides around your finger and smooshing them flat and securely. In this design I wanted a ridge leading to the points, you can add that by pinching along a line. Also curving the opposite end around your knuckle will help it tuck underneath the next segment. Rows 2 and 3 should be made this way. 12. 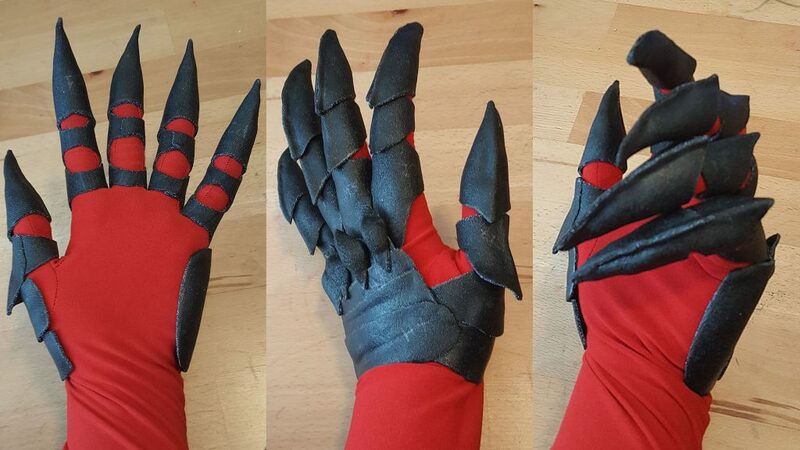 Fingertips are a bit different, but mostly consist of pinching the heated Worbla from the ends to the tip, then bending the amount of curve you want. Try your pieces on together as you go, and don’t be afraid to reheat parts to adjust the fit. 13. Hand panels are even easier. Just heat them then shape them on your hand where you need them. Do any pieces that connect in order, so they’ll still be warm when you join them. This design has an open palm, so all the hand pieces can be connected without hindering movement. 14. If you have any details, like the knuckle mounds here, add them now. For these knuckles, little balls of scrap Worbla were rolled and stuffed underneath the diamond shapes to give them dimension, then the diamonds were pinched to create ridges. 15. Try on all your pieces at once! You should be able to wear most of these like rings, and fit the tips on far enough to test the motion. Spread your fingers, make a fist. Make sure you’ll be able to do whatever cool pose you’ll want to make at con. If you’re satisfied with the fit, it’s time to prime. 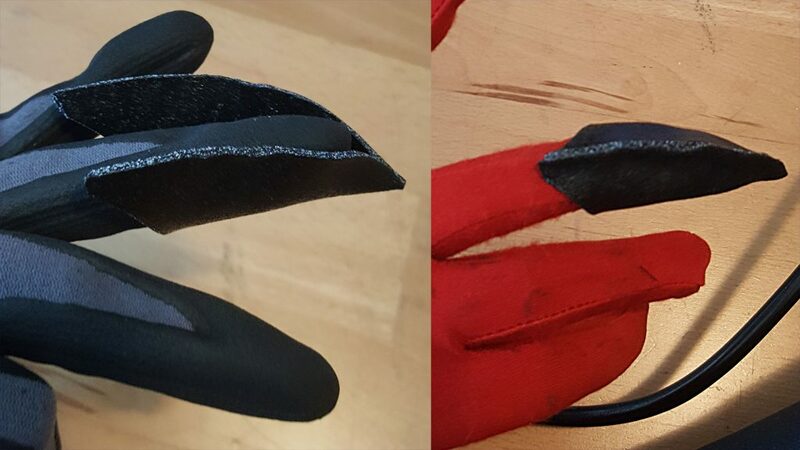 When you’re done painting and want to finish your gauntlet, put on your glove and put a drop of glue on your glove’s finger segment, slide on your Worbla, and press it down. Repeat for each piece.